Corrosion Atlas: A Collection of Illustrated Case Studies, Third Edition includes 679 case histories divided over 135 materials in 13 material groups, 25 systems (installations) and 44 different phenomena. It is an essential reference work on the design, fabrication, operation and maintenance of the extremely varied and often very complicated systems and machinery used in today's technology. Case histories, with cross-references and indexes, make this book a critical resource in the solution of many corrosion problems. In addition, it brings team members closer by presenting a common language for all parties. Finally, the book serves as an important educational aid for self-study. Because of its unique, extensive, clear and beautifully produced material, the book presents a much closer link between education and the practice of corrosion prevention and control. Foreword. Preface. Acknowledgements. 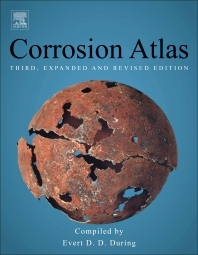 User guide for the Corrosion Atlas. Classification of the case histories. Phenomena Index. Systems Index. Section A: General Information. Introduction. Part I: General aspects of corrosion, corrosion control and corrosion prevention. Part II: Corrosion topics. Part III: Corrosion in water-bearing systems. Glossary of terms used in this work. Information about the microprints. Information about magnifications of some macroprints. Qualifications and compositions of stainless steel. Section B: Case Histories. Carbon steels. Unprotected carbon steels. Galvanized steels. Coated carbon steels (other than zinc and plastic linings). Stainless steels and non-ferrous materials. Stainless steels. Nickel and cobalt base alloys. Copper and its alloys. Aluminium, magnesium and their alloys. Lead, tin and zinc. Noble and reactive metals. Plastics and plastic linings. Concrete and cement mortar linings. Coated metals (other than carbon steel). Other materials. Section C: Supplementary Information. List of national corrosion associations. Corrosion bibliography. Advertisements. Very nice! Well information of corrosion fallers!